One of the colors missing from my prairie this year is the orange of the Michigan Lily (Lilium michiganense). I have beautiful mature plants in the wet mesic area. Every year the deer eat some of the buds, but this year they ate every one. As much as we enjoy seeing the deer and the fawns visit our yard, this is one dessert I wish they wouldn’t sample so gluttonously. Michigan Lily (Lilium Michiganense) grows in wet to well-drained soil in full sun to part shade. 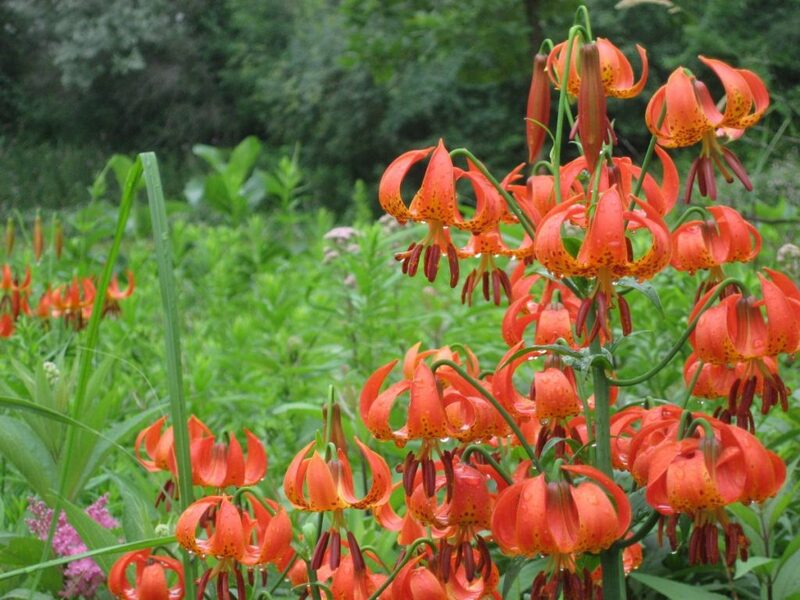 Their turk’s cap-like blooms have the same fiery orange, spotted flowers the Turk’s Cap Lily (Lilium superbum) has, but the Turk’s Cap Lily is larger and has a green star in its center. A gorgeous addition to any garden.